Tennessee Tech University (TTU), over the last 5 semesters, has planned and delivered the “TED Talks of Additive Manufacturing,” says Dr. Ismail Fidan, Professor of the Department of Manufacturing and Engineering Technology. The series, known as the “Golden Eagle Additively Innovative Lecture Series” is delivered via Zoom, a web video conferencing platform. NOTE: If you or your students are looking for the most current 3D technology and the opportunity it presents, sign up for the web-based lectures on 3D printing here. Full text details on the webinars are at the end of this post. The lecture series has trained 500-plus people from all over the world, from Africa to Europe to North America, on a wide variety of timely, hot Additive Manufacturing (AM) topics. These talks are aimed at AM industry professionals as well as STEM educators. 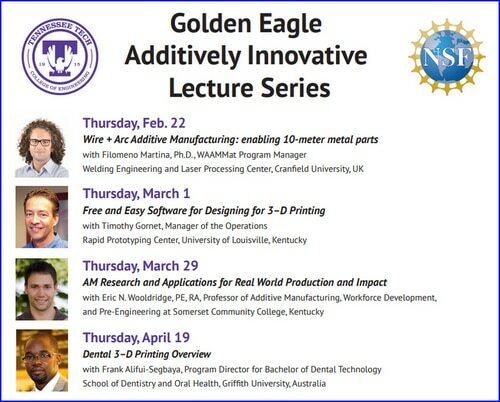 If you have been looking for on-point, deeper talks about Additive Manufacturing, keep tabs on what Dr. Fidan and his team are doing at Tennessee Tech University. The lectures are offered through the iMakerSpace, which was established as a university-wide, student-centered space under the leadership of the Colleges of Engineering and Business. It serves as a focal point on campus to provide training, service, partnership, research and evaluation in Innovation and Entrepreneurship to all disciplines. It also encourages interdisciplinary teams and provides support and training to extend Innovation and Entrepreneurship (I&E) activities into research and the classroom. Spring 2018 schedule of Additive Manufacturing is linked above. Full text of the past and upcoming webinars is below. AM WATCH is an ATE funded project focused on the skills AM technicians need to know. The AM Studios provide STEM educators with the education/training/exposure to 3D that they can integrate into their current programs.